Home > Blog > Water Features > Your Pondless Water Feature Needs Regular Maintenance Too! 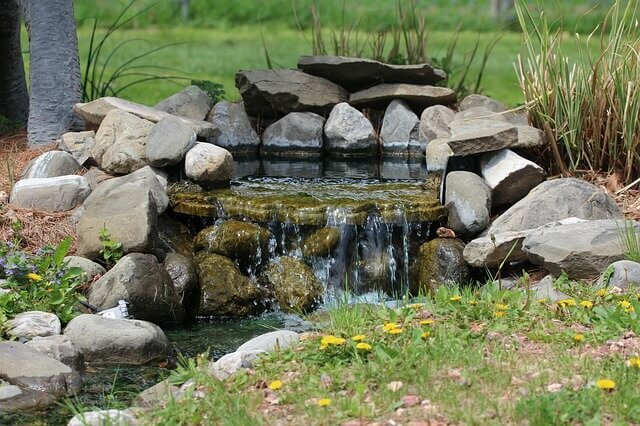 A pondless water feature can make a spectacular addition to your water garden or pond. Examples of such items include a bird bath, bubbling rock or fountain or disappearing waterfall. These objects spice up your pond and make it appear both elegant and sophisticated. However, installing such as feature comes with the reality that it must be regularly maintained. The good news is that smaller water features are easy to handle. Below are some best practices. The clarity of the water is exceptionally important. Many pond owners make use of clarifier products which are all natural so that the bacteria will consume the organic debris, keeping the water as clear as possible. These products should be used every couple of weeks, especially when water temperatures reach 50 degrees Fahrenheit or more. Just add a single ounce for each hundred gallons of water to give it that crystal, sparkling look that is so pleasing to the eye. Avoid using chemicals which are harmful to fish or other wildlife that are present in the pond. The water feature’s pump, connections and tubing should be regularly inspected to make sure they are operating correct and that no damage has been sustained. Any malfunction involving these components can result in problems with the water’s appearance or quality. You will also need to top off from time to time, which means that you should watch the water level within the basin of the water feature and remove some (or top off) if it gets too high. Overtime dust will accumulate and cause the water feature to become dirty. Once this occurs the debris will begin to collect and when it breaks down a nasty slime will remain. As a consequence, it will be necessary to remove the bigger debris manually and then apply a special cleaning solution to the water. The best products are those which are highly concentrated as they will safely eradicate debris which has accumulated over time while clearing out organic materials which are stuck as well as discoloration on the surface. The best products on the market will give you the desired results within 48 hours. However, many brands cannot be used on water features which are in close proximity to fish or other aquatic animals. It is also important to consider the time of year in which you operate your water feature. As winter gets closer and temperatures begin to drop, you should be cautious with regard to operating pondless fountains. While the flowing water make look visually appealing as it flows in the colder air, the freezing temperatures and ice which forms can actually damage it significantly. It is therefore best to shut it down beforehand, and when doing so you should make sure that the pump is disconnected from the basin and put in a water bucket and stored in a place where it will not be subject to freezing.